La Cañada has returned to Valley Forge, kicking off the 2019 student programs at Freedoms Foundation at Valley Forge. 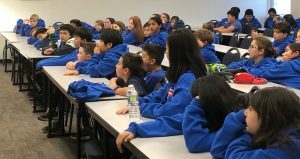 For decades, fifth graders from California’s La Cañada Elementary School have made the long cross-country trek to Freedoms Foundation, immersing themselves in historic sights and chatting up “founders” about liberty and freedom, rights and responsibilities, and the role the students will one day play in the nation’s future. Teacher Corinne Ellis first learned about Freedoms Foundation’s programs in the 1970s and approached her principal, Don Hingst, about participating. He couldn’t have been more supportive, taking the lead on organizing the trips for years. Even after he retired he chaperoned, for La Cañada and its sister schools, Paradise Canyon and Palm Crest. “He’s a history buff himself, and after he came that first time he just knew it was an experience you could never replace for the kids,” said Don’s daughter, Barb Drange, a fifth-grade teacher at La Cañada who now organizes the trips for 80 to 90 students a year. After arriving on campus from Philadelphia International Airport, sleepy students are briefed about the week to come. The group visits the site of George Washington’s victory in Trenton, crosses the Delaware – on foot via bridge, tours historic Philadelphia, and gets a feel for the cold, wind-swept expanse of Valley Forge National Historical Park. In the evenings, back on the Freedoms Foundation campus, historical interpreters portraying Washington, Thomas Jefferson, and other Founders offer their perspective of the Revolution and the nation’s beginnings. One of those California kids who came as a fifth grader – Barb’s daughter Kelsey – returned last year as a chaperone. Jenny Franz first came on the trip as a student and by 2018 was making her 12th trip as a chaperone – on her first, Kelsey was one of the fifth graders. Franz is still moved by the historic sites and the students’ reactions to it all. For some students, it’s their first time away from home or even their first plane ride. “It’s a good chance for them to grow socially and emotionally,” Barb Drange said. “They learn to get themselves up, get where they’re supposed to be on time. We have plenty of adults on hand, but it’s really a chance for them to take responsibility for themselves. And we often hear from parents afterward how their kids have changed.” Parents are so enthusiastic about the trip that there are always many more volunteers for chaperones than are needed. Drange appreciates the support, both for what the trip means to the students and what it has meant to her family.